Researchers studying one of the world's rarest seabirds have captured what is believed to be the first photo ever taken of a bird in flight with an egg inside her visibly protruding in the form of a little baby bird bump. 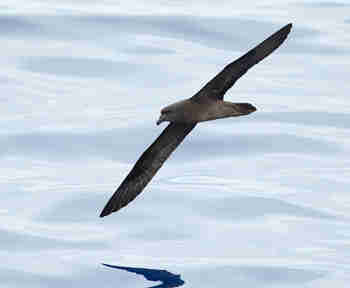 But this image of a clearly-expectant Mascarene petrel isn't just a novel; it's helping scientists to better understand the breeding cycle of a bird which, until now, has been a mystery. This petrel species is only found on Réunion Island, a few hundred miles east of Madagascar, living in colonies containing perhaps just a few dozen breeding pairs. Their small, isolated population puts them at high risk of extinction, prompting them to be classified as a critically endangered species. Vincent Bretagnolle, co-author of a study on the team's findings, tells Birdlife International that this rare sighting, along with several others, indicates the birds have a more robust population. 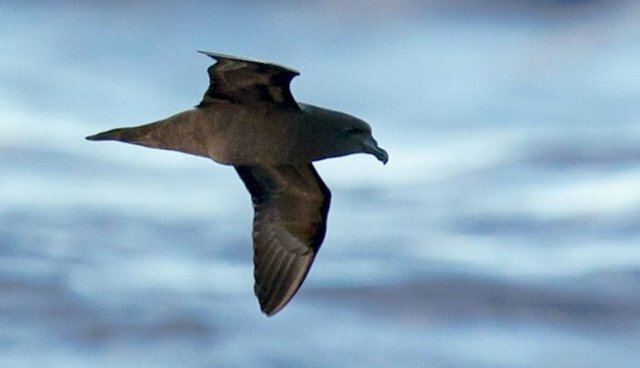 "With some estimates of only a few dozen breeding pairs of Mascarene Petrel our at-sea records suggest there are more individuals than thought, and that unknown colonies somewhere on the island have ensured the future of this species, at least for now." "Against the background of a pinkish-orange sunset, with Réunion Island in the distance, I spotted a petrel through my camera's viewfinder. Almost immediately I saw the outline of an egg, a huge bump at its belly. I called out to the other expedition members - ‘she has an egg, she has an egg...' "She flew close to the boat which gave me the unique chance to photograph her just before the sun set. It was a magical moment, and to think that in less than an hour she would probably lay her egg and contribute to the future survival of this threatened species."